The brain and spinal cord are surrounded by a protective membrane called the meninges, which are made up of three layers, the dura mater, the arachnoid membrane, and the pia matter. Tumors that arise from this tissue, especially the cells that make up the arachnoid membrane (arachnoid cap cells), are called meningiomas. Meningiomas usually are benign, slow-growing tumors, although, in rare cases, they may be malignant and invade the surrounding brain tissue. These tumors are relatively common, making up 15 to 20 percent of all primary brain tumors, and can occur anywhere on the meninges. The tumors can occur in anyone, but they appear to be most common in middle-aged women. The symptoms of a meningioma are caused by the pressure the growing tumor exerts on surrounding tissue. These tumors can occur in a variety of places and therefore cause a wide range of symptoms, although they tend to occur in specific regions around the brain. Depending on the location of the mass, meningiomas may cause headaches, nausea, seizures, weakness or numbness in the limbs or face, visual problems, and gradual changes in mood or personality. The symptoms tend to increase in severity as the tumor grows in size. 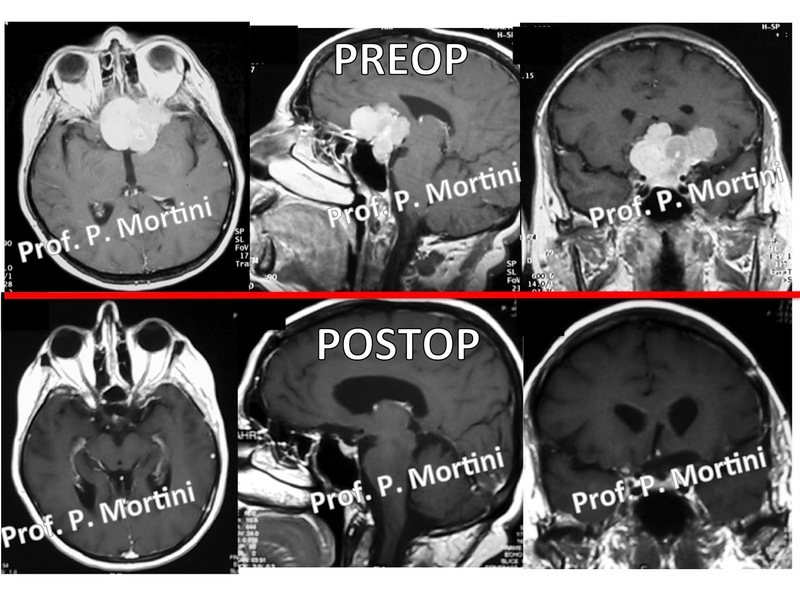 Imaging studies are the key component in the diagnosis of meningiomas. Skull x-rays can be used to spot a meningioma, and computed tomography (CT) and magnetic resonance imaging (MRI) scans are used to provide increased levels of detail. An angiogram, which allows physicians to visualize the blood vessels in the area, may also be used. If a tumor is small and does not cause symptoms, it may be observed over time rather than treated immediately. In cases in which treatment is necessary, the first line of treatment for meningiomas usually is surgery. Because the tumors are benign, and rarely invade the surrounding brain tissue, complete resection often results in a cure. Some tumors, however, may be difficult to remove completely, especially those that occur near important structures at the base of the skull. In addition, meningiomas have a tendency to recur even in cases of complete resection. When a tumor is removed, it can be examined under a microscope to assess the risk of recurrence and dictate the next step in treatment. Radiation therapy may be used as a follow-up treatment, especially for malignant tumors. 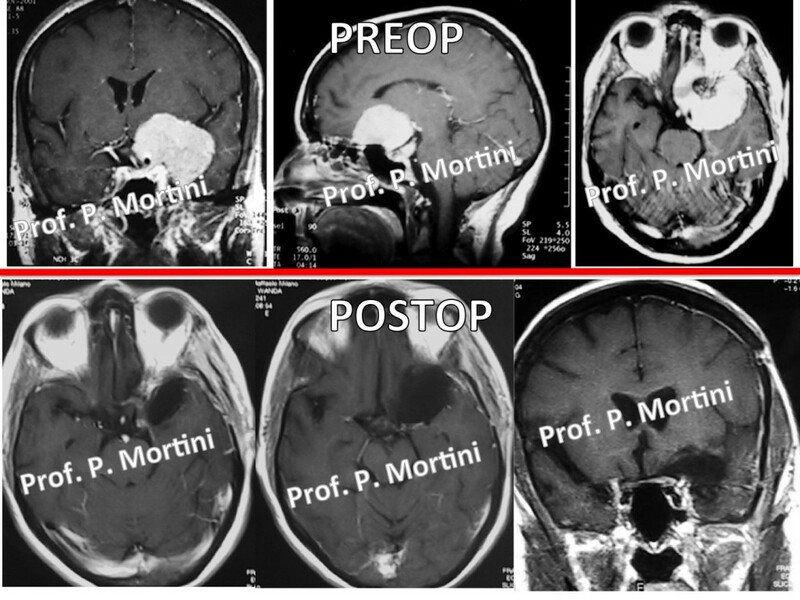 In addition, stereotactic radiosurgery, which involves the use of a highly focused beam of radiation to target the tumor, may be used as either primary or adjunct treatment. Chemotherapy has yet to show benefits for patients with meningiomas, although because the tumors are believed to have some hormonal involvement, treatments that affect this process are being investigated.